As usual, that set my thoughts in motion. 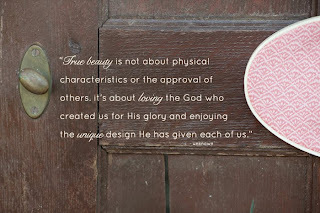 What really is true beauty? Over the years I’ve heard people say things like: Beauty is in the eyes of the beholder; Beauty is more than what meets the eye; Beauty is inside, inner and innate. Well, all these may be true. Now according to dictionary.com, beauty is the quality present in a thing or person that gives intense pleasure or deep satisfaction to the mind, whether arising from sensory manifestations (as shape, color, sound, etc. ), a meaningful design or pattern, or something else (as a personality in which high spiritual qualities are manifest). That almost said it all! Beauty is what appeals to our minds, attracts our eyes and offer to us a sense of pleasant feeling. Most often than not, our first definition of beauty comes from how attractive what we see is. We always seem to start our definition with what is aesthetically pleasing to the eye. But what really is True Beauty? Well, I have a simple definition - True Beauty is when the mix of Character + Attitude + Actions results into a desirable persona. I’ll give you four points to explain further. 1. True Beauty is Intrinsic - This is where I agree with the fact that beauty is more than what meets the eye. True beauty is deep-down and at the core of a person’s character and attitude. Has anyone noticed that you might not think someone looks particularly 'beautiful' as first glance but then after talking to them for a while their mannerisms and personality seem to project their beauty? The opposite can also be true. Someone who looks beautiful can seem less so if they exhibit unattractive personality traits. A chiseled face or a gorgeous body alone doesn’t make a person attractive. While the looks can be a bonus, it is what is inside that takes the day. 2. True Beauty is a mix - It is a mix of good character, balanced attitude and good actions. One factor alone doesn’t stand to give us a complete picture of true beauty. Character and attitude define a person, as such, it defines true beauty for anyone. After all, don’t we all love "Shrek the Ogre"? 3. True Beauty is communicable - True beauty is infectious. It is contagious. The person leaves you with a feeling of pleasantness and sparkle. My old friend puts it this way, “When you meet someone of true beauty they light the fire in you”. 4. True Beauty doesn’t fade with time - Instead it improves with age. Just like wine, it gets better with time. At the end of the day, true beauty is what really matters because it truly is what matters. Dyaji Charles writes on Leadership, Productivity, Faith, Relationships, Business and Entrepreneurship, Motivation and Inspiration and some stuff that I find worthy from time to time. He has a blog, www.dyajicharles.com, where he will find more of his writings.